Isaiah Gabriel Andres came to us November 21, 2001 in Kansas City, Missouri, as a tiny, four pound seven ounce baby with the cry of a lamb. He grew to be a Big, Boisterous, Beautiful boy with the cry of a Warrior. Following a tragic accident, Isaiah passed September 8, 2018 at Children’s Mercy Hospital in Kansas City, Missouri being held by his parents, the loving and caring mother, Kristin Davis and his loving and caring father, Craig Andres. Isaiah will be remembered as a beacon to his mother and father, a bright light that will never be extinguished in their hearts and the hearts of so many lives he touched in so many ways. Isaiah never knew a stranger. Isaiah was always a friend to everyone. The gregarious, strapping young man played football at Peabody-Burns High School with his dear friends. So, so many friends. He was very active in band, pounding away on his father’s drum set. He was a strong voice of the choir. Not just a beautiful, sweet tenor and bass voice, but the loud voice that always entertained the choir members each morning. Music soothed his soul and he loved sharing his music. Isaiah also had an innate intelligence that is not often found. He continually astounded his mother and father and grandparents and uncle and those around him with that intelligence. The Farm was his life. He loved being on the farm and would ride for hours and hours on his small cycle, just cruising at 20 miles an hour soaking up the countryside. He would park at the top of the hill every night and take pictures of the sunset, something he and his father did together from a very early age. He enjoyed mechanics and wanted to own his own shop, eventually making engines that did not run on gasoline. It is hard to explain how much Isaiah loved. He fiercely loves his mother and father. Isaiah shared a deep bond with his father that began at a young age and continued to his passing. “Dad, when are you coming home?” Each and every day. He still hugged his mother and father each and every time he saw them. Always. And every time he was hanging up the phone he would say, I Love you dad. I love you mom. Grandparents were always there with Isaiah. He always craved seeing them. He always took the time to really talk and listen to them about their lives and would ask questions about his heritage. He truly cared about where he came from and where he was going. His uncle offered words of advice. Isaiah listened. Always caring what people had to offer him. Because Isaiah was such a bright light, he attracted people, naturally. It was effortless to be drawn to his spirit. 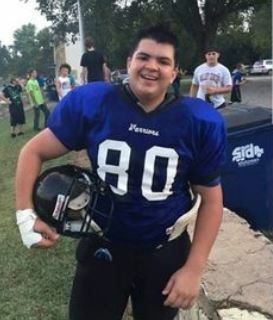 He was a large 16-year-old with the sense of humor that often attracted children because of his enormous size, coupled with his incredible warmth. He could often be seen and heard with his thunderous truck and thunderous footprints in downtown Peabody, talking to friends. And always listening. He roamed the countryside with his friends in his truck. So many hours spend with those he chose to call best friends. He would park at the corner with those friends and watch those Kansas sunsets. Isaiah had found true love, and knew how to share that love in a caring and selfless way. It was in his nature to give. Always. We know that Big, Boisterous, Beautiful boy with the cry of a Warrior will still be loving us. He will continue wrapping us all up in his bear hugs with his massive hands and massive smile. We all love you so dearly, Baby Zaya. Forever. Isaiah is survived by his parents: Craig Andres and Kristin Davis; siblings: Gavin Andres, Lucas and Dominik Dickey, and his brother Austin Stahlheber. A Celebration of Life service is scheduled for 3:00 p.m., Saturday, September 15th at Peabody High School, East Auditorium. There will be a celebration following the service at the Andres farm, two miles Northeast of Peabody and everyone is encouraged to attend. A private committal will be held on Sunday. There will be no public visitation prior to the service. A memorial is being established with the March of Dimes. Dear ones, our hearts are broken for you. I loved reading about Isaiah and getting to know him a bit by your words. We are praying for you all. I never had the joy of meeting Isaiah but I got to know his father fairly well in the last couple of years. I know this is truly devastating to Craig and all of his family. Craig always spoke of Isaiah, every day. He spoke of his determination in football and constantly showed his pride for this young man in a fatherly way. If nothing else, Craig, know that Isaiah will be forever gold, forever young and will run For all eternity in heavenly fields. You will see him again one day. All of our love to you at this devastating time. I hope those prayers will show you that golden shore one day. My deepest sympathies to your family. Isaiah was such a great kid. He always brightened my day whenever I would see him.My prayers are with you all. Fly high my Superman, fly high.